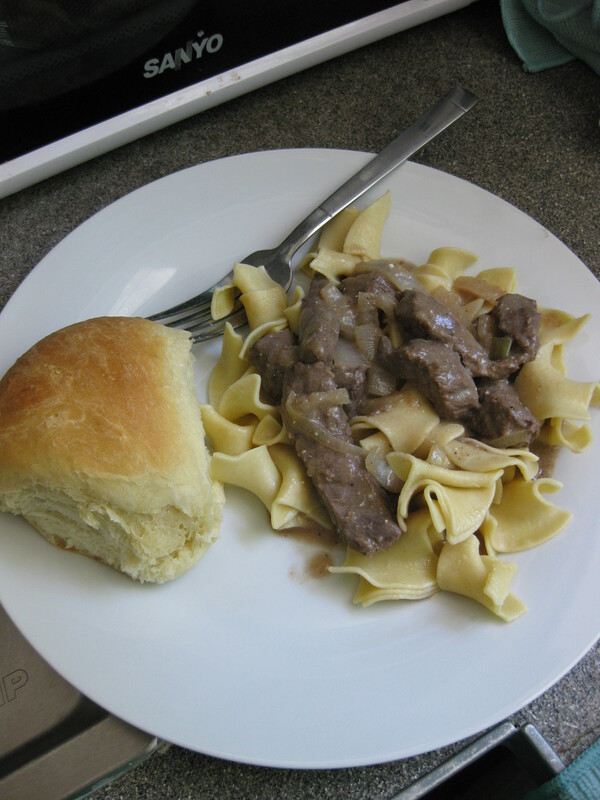 So, since I didn’t post yesterday, this one might be a little on the longs side…My Husband has, every once in a while, mentioned he likes Beef Stroganoff. This is all well and good, my problem is that he doesn’t care for mushrooms (nor do I, for that matter, thanks to Bear#2), and I was never able to find a good recipe that didn’t call for them. Well, readers, I finally found one.I told my hubby that I was going to make it for him for lunch when he got home from class. He was, of course, suspicious, thinking that it would have mushrooms. I told him not to worry, and that we were also having<—— these delectable rolls. He left and I started getting busy with my morning chores so I could get down to creating said rolls so they would be hot and fresh when he got home. As I was in the process of straightening up the living-room, One of my dear friends, Courtney pulled in the driveway with her litle boy. She had had a prenatal appointment that morning and was stopping by to see if I wanted to go to brunch! 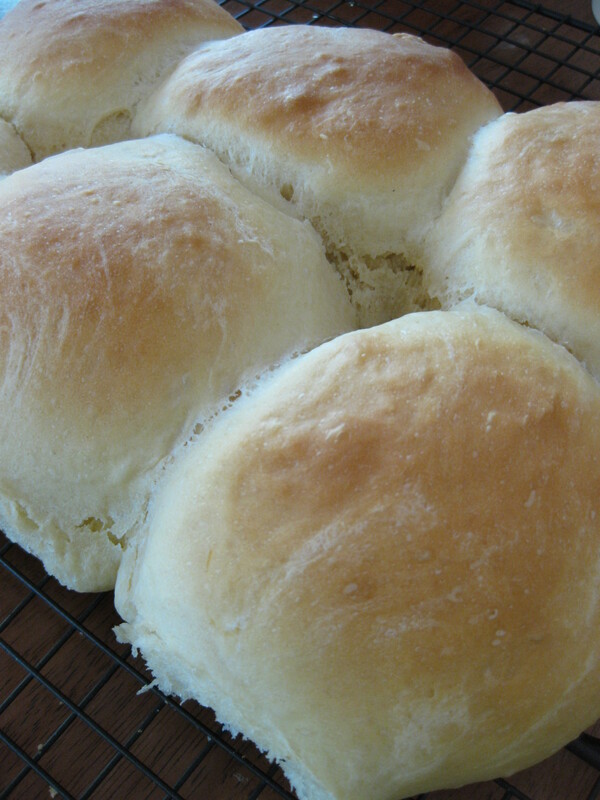 Well, I got all caught up on the housework and set out my tools and ingrediants to make the rolls. Courtney has never made bread, and I don’t think has ever SEEN bread being made, so she was all eyes and questions :). I enjoy sharing my craft with willing learners, and I may have a student in her. Anyway, I mixed up the dough, kneaded it to a lovely smooth elasticity and dropped it in an oiled bowl to rise. Little Bear#3 has seen the dough in action from this point and told Courtney I did that so the dough would “get big!” lol…he has obviously been paying attention :). I put Goldilocks down for her morning nap and jumped in the shower ( all about multi-tasking, I had an hour to wait for the dough to rise). When the dough had doubled I showed it to Courtney so she would know what #3 meant when he said “get big”. What started out small enough to fit in a 2 quart bowl now nearly filled an 8 quart. She was impressed, lol..amazing thing, yeast. When given something to feed on, it can nearly quadruple the size of things. Anyway, so that was only half the work. I punched down the dough and set to making the actual rolls. The recipe I use can make anywhere between 20 and 30 rolls depending on the size you want. I made 20, so they were large, about the size of a sandwich roll. I set those aside to rise in the pan for about 30 minutes and got ready to start the main course. As you can see in the picture the baked up nice and golden, they tasted even better :). Succulent Beef with a rich, flavorful gravy..just how it should be 🙂 And NO MUSHROOMS!!! Nana has and I have watched her make it a few times over the course of my life. I also knew that there were a few little changes that I wanted to make to bring out the best flavor, the richest gravy. I followed the recipe on the basics such as the spices and such, but i switched it up when it came down to the actual cooking. I melted the ghee ( I replaced the butter and oil in the recipe with it) and tossed in the beef and onions to brown, along with the flour and spices. That was where I made the first change. I thought that the meat should get the spices cooked in and the gravy could take from that, not the other way around as was said in the recipe. Once the beef was browned and the onions tender and translucent, I added the beef stock, about 2 Tbsp more of flour and another 1/2 cup of water, brought it to a simmer, covered it and left it alone. It was time to start the noodles, and all was finished just as the hubs walked through the front door. Courtney had been trying to get her boy down for a nap on the couch, so Hubby saw her first. He asked her…”Is she playing Betty Crocker?” to which Courtney laughed and answered in the affirmative.